Microsoft made an announcement back in June that the two programs Windows Live Sync and Live Mesh Beta would be brought together as Windows Live Sync Beta as part of Windows Live Essentials beta. The main goals of the project were to offer Windows Live Sync users with options to synchronize files to PCs and the Cloud, to offer easy access to PCs and document collaboration using SkyDrive. 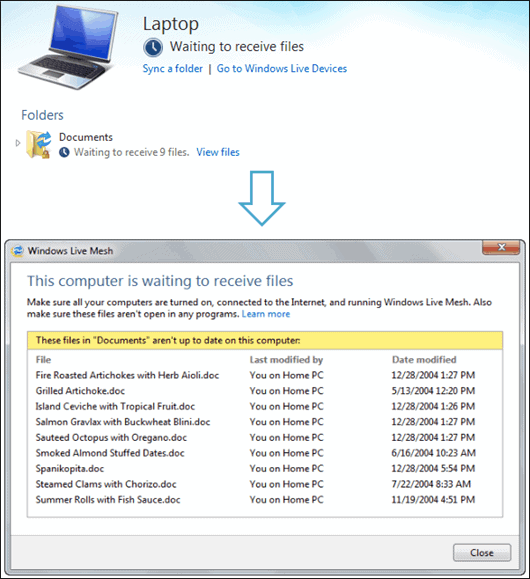 Less than two months later Microsoft made the decision to change the Windows Live Sync Beta name once again. The product has been renamed to Windows Live Mesh, apparently because of the feature additions remote access and cloud storage, which extend the program beyond synchronization. Microsoft fortunately did more than just rebrand the product. Two feature enhancements have been added to the syncing capabilities. First, hidden files and folders can now be synced with Windows Live Mesh, something that the previous version was not capable of doing. Second, Windows Live Mesh now displays the missing files in a folder, displaying the file names, last modification devices and dates they have been modified. Additional cloud storage has been added. Beta participants of Windows Live Sync received 2 Gigabytes of cloud storage. Only 2% of those users have been using more than 1.5 Gigabytes of space, which usually is a good indicator that the space limits are sufficient for the majority of users. Microsoft still increased the storage limit from 2 to 5 Gigabytes for all users of Windows Live Mesh. And that is on top of the 25 Gigabytes offered by Live SkyDrive, as the two online storage systems are independent of each other - for now. Finally, performance has been improved in Windows Live Mesh according to Microsoft. "We worked on cutting the application load time in half " says Allison O'Mahony, Principal Program Manager Lead, Devices & Roaming. She continues by stating that Microsoft have "optimized both memory and CPU usage during sync activity as well as decreased CPU consumption by as much as 30% when Windows Live Mesh is idle".